A parliamentary report of 1777 recorded parish workhouses in operation at Rye (accommodation for 60 inmates), Brede (30), Iden (20), and Winchelsea—St Thomas the Apostle (24). The Rye workhouse relocated in 1791 to a property on Gun Garden. 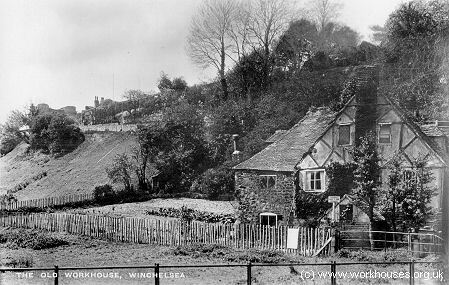 Winchelsea's parish workhouse was located in a building on the Tanyards Lane, dating from around 1500. The building is now occupied by the Strand House Hotel. Northiam had a workhouse on what is now Station Road. Workhouse Pond still lies in the vicinity. Brede's workhouse stood at Cackle Street, at the east side of the junction with Pottery Lane. In 1842, the site was sold to a Mr. Lazarus, who divided the premises into several tenements and a grocer's shop and called it 'Alpha Place'. It was later used to house council tenants. The property survived until 1939 when it was demolished after being condemned by the Battle Rural District Council. Beckley, Icklesham, Playden, and Udimore also had workhouses in operation in the early 1830s. County of Sussex: Beckley (2), Brede (2), East Guldeford, Icklesham, Iden, Northiam (2), Peasemarsh, Playden, Rye (4), Udimore, Winchelsea — St Thomas the Apostle. Counties of Sussex and Kent: Bromhill. The population falling within the Union at the 1831 census had been 11,418 with parishes ranging in size from Bromhill (population 42) to Rye itself (3,715). The average annual poor-rate expenditure for the period 1832-35 had been £11,588 or £1.0s.4d. per head of the population. 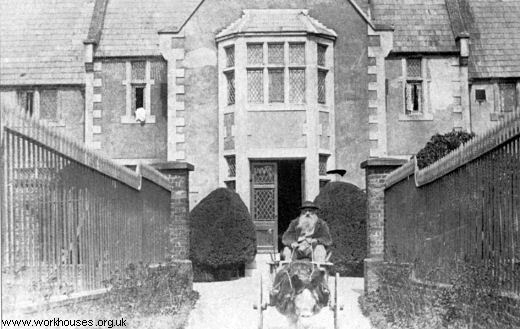 Initially, Rye Union made use of existing parish workhouse accommodation at Rye, Northiam and Brede. Former parish workhouses at Beckley, Brede, Icklesham, Playden, Udimore and Winchelsea were sold off in the late 1830s. Construction of new purpose-built workhouse for 436 inmates began in 1843 with the first admissions taking place in 1845. It was designed by SO Foden in collaboration with HW Parker and had what at this time was a relatively uncommon T-shaped layout similar to that found at St Albans, Hemel Hempstead and Barnet. The hub at the centre of the T contained the Master's quarters. Female accommodation was at the east, and male at the west. The dining room was located in the wing to the north. An infirmary was erected to the north of the workhouse in 1846-7. The workhouse location and layout are shown on the 1875 map below. Courtesy of Les Bearman and Alan Dickenson. After 1930, the former workhouse became a Public Assistance Institution also known as "The Retreat". In 1941 it was requisitioned for military use, with the inmates being evacuated to Socknersh Manor. The nearby field of Fair Meadow was the site of am ammunition store. Immediately after the war, the building was used to provide temporary housing for evicted families. In 1949, it joined the National Health Service as Hill House Hospital, providing care for the mentally and physically handicapped. A nurses' home was erected at the north-east of the main building in around 1949. The hospital also had its own school on land to the west of the main block. The hospital closed in around 1980 and the site stood disused for a number of years until being sold to developers. 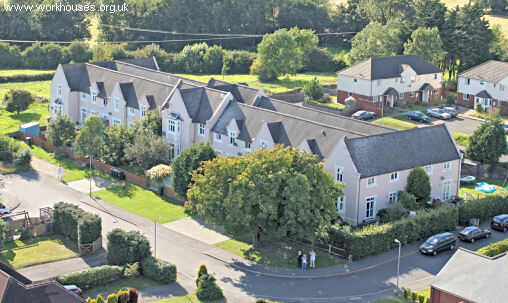 Only the main block and nurses' home survive and both have now been converted to residential use. Rye main building from the east, 2007. 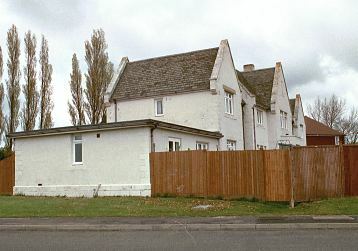 Rye former nurses' home from the south-east, 2001. East Sussex Record Office, The Keep, Woollards Way, Brighton, BN1 9BP. East Sussex Record Office, Lewes — holdings comprise: Guardians' minutes (1835-1930); Indeed relief lists (1836-98); Register of inmates (1915-30); Births (1915-30); Deaths (1844-66, 1915-30); Accounts (1835-1928). Thanks to Nick Chillingworth for providing material on the Rye union workhouse.